The thieves making their escape. 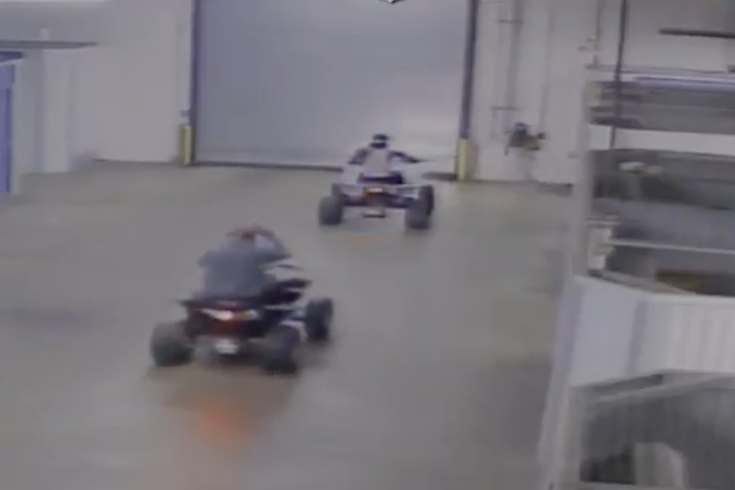 Philadelphia Police released a video Friday of three unknown male suspects breaking into a storage facility and stealing ATVs. According to police, the theft took place Aug. 8 at the Compass Self Storage facility in East Parkside, at 1300 Belmont Avenue. The thieves forced open a door at the facility, climbed on top of storage containers, and escaped on the ATVs. If you have information on these suspects, you can submit a tip to police via telephone, dial 215.686.TIPS (8477) or text a tip to PPD TIP or 773847.